In the shade beside Highway 20, the old sign tries to welcome drivers to Albany. On a rainy day around maybe 20 years ago, a group of city officials, reporters and others gathered in the brush beside Highway 20 in North Albany to dedicate a brand-new “Welcome to Albany” sign. Now it might be time to again refresh the old wooden sign or even replace it with one that can actually be seen. A reader suggested that this be done. In response, last week I took my first close look at the sign since that wet day long ago. I also inquired at City Hall. 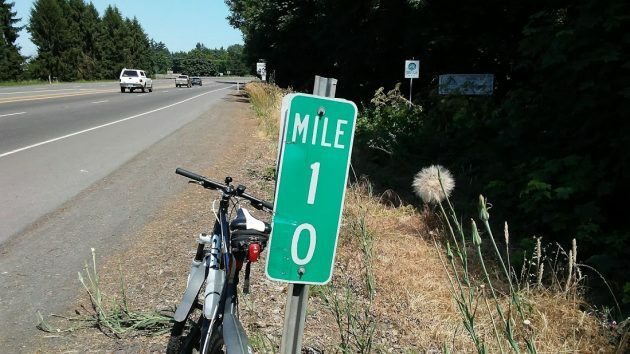 “Our sign on Highway 20 is small, old, and due for another reconditioning,” responded Ed Hodney, director of parks and recreation who also now heads the CARA urban renewal program. Through the roadside weeds, a closer look at the Albany sign. Mr. Hodney’s wishes for, “something we can be proud of,” begs the question. Were the folks who put up the original sign not proud? 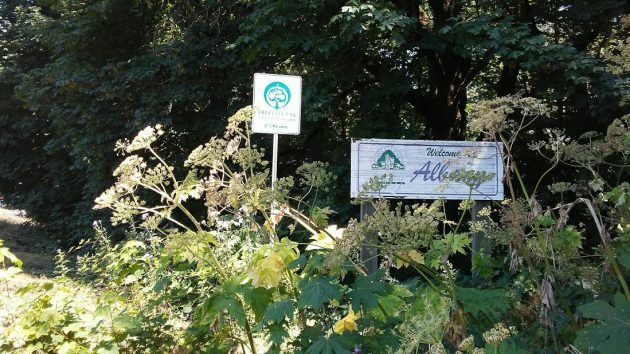 Did you, by any chance, Photoshop the massive weed mass, then place it pleasantly in the foreground so as to hide the Welcome to Albany sign, thereby allowing you to make and or spread The Hering Agenda? Clearing the weeds up around the sign would help for now. I’ve noticed that there are more stop signs etc in the city that are covered from tree branches hanging on them. Is that the city’s responsibility? Yes, that is the City’s responsibility. Let us know specific locations and we’ll trim the trees. Well, at least Hodney can’t use the slush fund (CARA) to build the sign. Downtown Albany is only blighted to the halfway point of the river. According to CARA the North Albany side of the river is not blighted. But I doubt the city attorney would let this inconvenient fact get in his way.